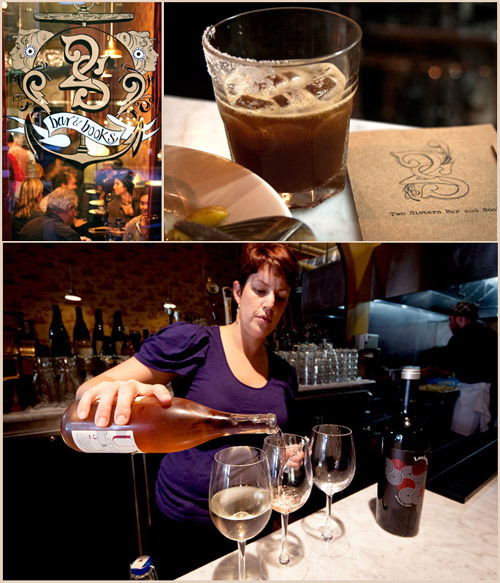 The San Francisco Hayes Valley neighborhood has just picked up a mighty cool new spot called Two Sisters Bar & Books. Basically, it’s a bar (wine, beer, cocktails, coffee, and tea), with books (for trading and/or reading), food (both delicious and wholesome), and a general European café feel to it that we were quite happy to see at their soft opening yesterday. It’s a small space that can maybe fit 30 or 35 people comfortably, but it’s an incredibly inviting space. The owners have worked to do their best to emulate the Parisian & Austrian café experience and it works to no end. What also works is how the food and drink selections were put together. For us, the wine selection was most interesting of course as it’s an eclectic assortment of wines from various regions. They all fit and are affordable, including a Chardonnay that comes out of a tetra brik package (more environmentally friendly), yet is still quite good. This is much unlike the nefarious Don Simon that anyone of drinking age in Spain knows well. There is also a very pleasant Garnacha from the Cariñena region that makes a fine, pleasing glass to drink. And really, what more could you ask for? But, this is all really just a summary of pieces that make up a greater whole. You can’t pick out one single piece that’s greater than another as owners Mikha Diaz and her sister Mary Elliott (thus the “two sisters” name) have really thought out the whole premise and created a cohesive café that San Francisco needs more of. Hayes Valley, you’ve never had it so good.